An extremely rare 1962 Alfa Romeo SZ sold for $820,000 at a government auction after it was freed from a basement in Turin, Italy. It was sitting for 35 years due to a broken elevator that was never fixed. The previous owner was a mechanic and, for some reason, parked his precious Alfa in his basement and couldn’t get it out after the elevator broke. The car sat there for 35 years until unfortunately, the owner passed away. 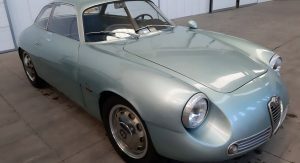 Apparently, the owner had plans to restore the rare Alfa Romeo Sprint Veloce Zagato that fell short after the car was trapped in the basement. Alfa Romeo only ever made 217 of them which makes it one of the rarest cars Alfa has ever made. The car is pretty much a Giulietta with a bigger engine and an aluminum body. This particular one is an early version with the round tail called the ‘Coda Tonda’. The car was in a really nice Blu Chiaro Metallizato finish. Alfa Romeo used to race these in the 24 hours of Le Mans and other private races. 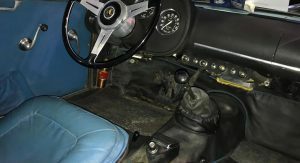 It had a 1.3L inline 4 cylinder engine that made 115 horsepower with dual carburetors. That was pretty impressive for the 1960s. This car marks yet another one of the many barn finds that were discovered recently. Some other cars that were found recently are some old Bugattis, a Lamborghini Miura and a Shelby GT350H.